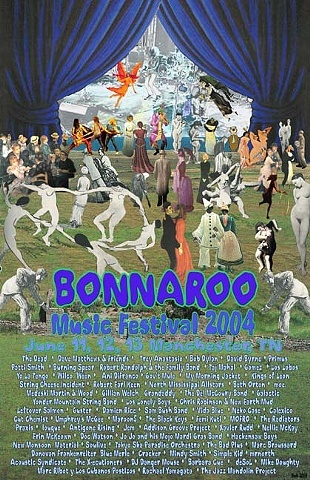 A friend of mine wanted me to make him a Bonnaroo poster because he didn't like the design of the ones being sold at the show. So I did. I used Photoshop and digitally deconstructed images of people from famous works of art, superimposed them onto a background of grass, added a curtain from one of my paintings, and added the band names. I was not allowed to do anything with them, but it was a fun project.